This Survey Project is ongoing until the nomination to the national register has been completed and submitted to the Board of Directors at the Minnesota Historical Society in St Paul MN. 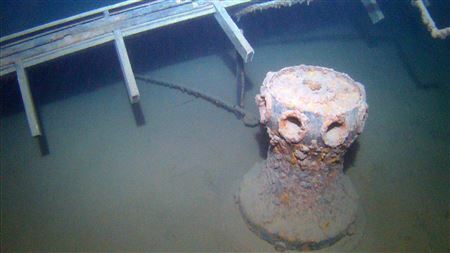 Harriet B Capstan Taken from Drop Cameras at 600 feet Deep. The Harriet B was discovered by shipwreck hunters in 2008 and had a potential to be nominated to the National Register of Historic Places. In this process the GLSPS needed funds to accomplish it's goals and ideals to finally place the Harriet B on the National Register. In March 2017 the GLSPS applied for another Legacy Grant to complete the deep water shipwreck survey to finally have enough information and photos to move forward on the nomination. This is another opportunity for members to join us to see and hopefully learn more bout the process. We are always looking for new faces so if you are interested please contact us!! 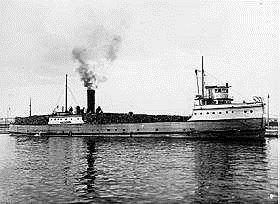 The GLSPS received a grant from Minnesota Historical Society to complete the fieldwork and write the National Register Nomination for the shipwreck Harriet B located three miles out of Two Harbors, MN. It is Minnesota’s most intact shipwreck, but unfortunately for those of us who are divers, it sits in 650 feet of water. Documenting the Harriet B shipwreck site necessitated utilizing a new generation of technology for our National Register work. When we started the project two years ago we used Jerry Eliason’s tethered drop camera and covered the whole site from a 45 degree down-looking view which allowed us to create a fairly detailed site model based on the video. However, our Wisconsin underwater archaeologist partners have raised the bar when it comes to documenting shipwrecks for the National Register of Historic Places. They have been generating accurate detailed site maps for many of the Wisconsin shipwreck sites and using the National Register Listing as the repository for both the detailed history and the accurate wreck site information. This seems like a great way to guarantee the longevity and public access to the results of the research. 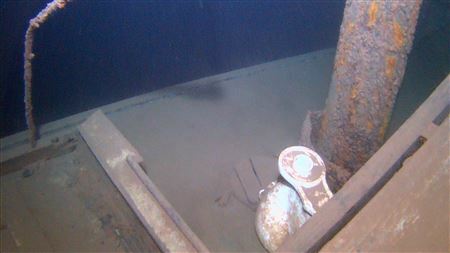 To get the similar accuracy in measurements and drawings for a shipwreck in 650 feet of water we contracted Tom Crossmon of Crossmon Consulting to record the site using his ROV video and multi-beam sonar which is attached to the ROV. We wanted to get a view of the cabin interiors through the open doors and windows of the ship. Analyzing the sonar output using the companion software archeologists Tamara Thomsen and Caitlin Zant will be able to determined very precise dimensions of any part of the site covered by the multi-beam sonar. The video will provide additional details that a tethered camera cannot access. Compared to the National Register Nominations written in the 1980’s and 1990’s this generation of nominations not only establishes the vessel’s eligibility as a historic place, but also catalogs valuable historical information about the vessel, the site, and its history. The fieldwork took place the first week of July using the GLSPS Research Vessel Preservation. Project participants were Tim Pranke, captain, Jim Christianson and Dale Koziol, boat hands, Tamara Thomsen and Caitlin Zant, archaeologists, and Tom Crossmon and Dave Phillips, ROV operators. Although the project was entirely successful as the team managed to collect all of the required site information it was not without its hang-ups, a term I use quite literally. Late in the project as ROV operators Tom and Dave switched piloting responsibilities, the ROV got entangled in the three inch tow hawser hanging over the fantail. It took hours and many attempts to untangle the $100 thousand dollar piece of equipment but all proved unsuccessful. Eventually they had to brute force pull it up which did work but ended up damaging the fragile tether. While GLSPS walked away with a successful project Tom walked away with a bill for a new tether which was only partially offset by his payment for the project. Everyone acknowledged that it could have been much worse if he would have lost his ROV, the outcome that was only marginally avoided by the skill and persistence of the team. Researching shipwrecks with expensive equipment is always a high stakes game which is why the contract costs often seem excessively high but that is the reason they are high. The Harriet B NRHP nomination is scheduled to be complete before the end of the year and should be available for submission to the state board in 2018. Depending on the backlog we might reasonably expect it to be accepted to the National Register by the end of next year.